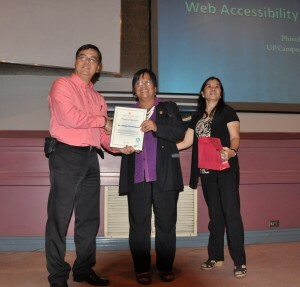 At the Web Accessibility Forum launched by the NCDA SubCommittee on ICT last July 20, 2010, National Computer Center Information Technology Officer Angelita Nicolas announced the issuance of an NCDA-NCC Joint Circular No.1 Series of 2010, enjoining all government instrumentalities concerned, to implement accessible website design using the technical guidelines recommended by the Web Design Accessibility Recommendation (WDAR) Checkpoints of the PWAG. PWAG or the Philippine Web Accessibility Group, is a non-profit advocacy group of Filipino web designers organized by the Council after its web accessibility workshop series from 2004-to 2007. Tasked by NCDA to monitor compliance by participating GO/NGOs through an NCDA Board Resolution, PWAG reported that only 11 GOs complied, compared to triple number in NGOs, which greatly concerns the sector. To address this low compliance, the SubCommittee on ICT chaired by he Department of Transportation and Communications pooled resources to hold the forum for NCDA member agencies, in time for the NDPR Week. Forum Resource Persons include PWAG President Remberto Jojo Esposa Jr., ATRIEV Executive Director Antonio Llanes, Jr. and Web Designer Rene Orense. To ensure full compliance in his Department, being a member of the SubCommittee, DOTC Representative Architect Rizal Morales would soon have a similar forum exclusively for all his Department bureaus. Inspirational messages from NCC Managing Director Juliana Sudario, Philippine DAISY Network President Lauro Purcil, DOTC Architect Rizal Morales and NCDA OIC Matt Lee, Jr. jointly urged the participants to adopt web accessibility to create digital opportunities for all, including PWDs, from the potential offered by ICTs for development. See full text of the Joint Circular.